The book boasts (both on the back cover and inside) that it is a book for those who love traveling and those who don’t, and I think that’s actually a very fair statement. 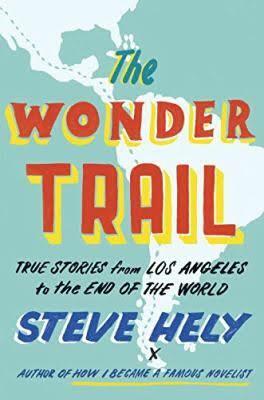 It’s a book that reminded me about everything that is both wonderful and terrible when exploring the world: uncomfortable linguistic mishaps, loneliness, and shiny new people with interesting stories, overrated and underrated sights. It also features plenty of history, which Hely presents alongside his anecdotes in short chapters. You don’t like history? Skip those brief chapters and they won’t detract from the rest of the book. Hely is sharply observant, and while some of his yarns ring slightly self-indulgent, I appreciated the colloquial, relatable way he presents them. If you like your educational information with a side of funny personal essay, this book is for you. If you like your funny personal essay with a side of educational information, this is also going to be a happy read. If you want an impartial travel guide with lists of five-star accommodations and local culinary delights, perhaps choose a different book from our travel guide section.